What’s the ‘real’ cost of that lobster on your plate? Tips to avoid unsustainable seafood. If you’re like me, you love seafood and probably won’t stop eating it anytime soon. But, do you really know where it comes from, and what kind of impact it has on the environment? What if I told you that some of the lobster you eat could be causing irreversible damage to our ocean’s most threatened species? In this post you’ll find out some tips to avoid unsustainable seafood and how to use your wallet in a more environmentally conscious way. 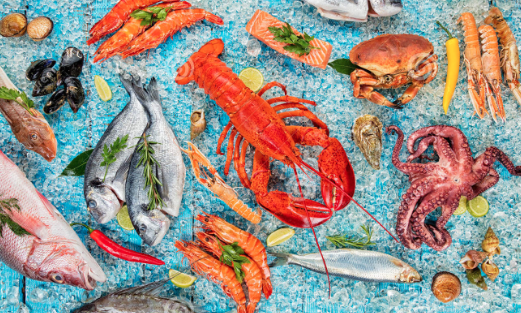 According to a market report by the USDA, consumers have been purchasing 80% of their seafood through a restaurant setting since 2008 (source). This means the first step to finding sustainable seafood must come through your voice. When visiting a restaurant that serves seafood, ask if they have any sustainably fished options for sale. Even a few inquiries could get the ball rolling for a restaurant to start seeking more environmentally friendly seafood. In fact, the same report mentioned above also found an average rise in the amount of concern consumers have about sustainability caught seafood. The surveyed participants also ranked higher in their concern about environmental impacts over the cost of the seafood for sale. So, don’t be afraid to say something, because you aren’t the only one asking important questions. Luckily, we live in the era of information technology. Checking in on sustainably fished seafood has never been easier with programs like SeaFoodWatch (SFW). Run by the Monterey Bay Aquarium, the SFW program aims to empower consumers with recommendations on which seafood is sustainable. A quick search on their website for ‘lobster’ shows an easy-to-read list of the best options for where to get lobster from, as well as good alternatives and even fisheries to avoid. The SFW program also partners with another seafood sustainability organization called the Marine Stewardship Council (MSC), which runs scientifically backed assessments of fisheries all around the world. Clicking on ‘Eco-Certifications’ on the SFW website will display the fisheries who have been awarded the MSC blue label of sustainability. They even have an app to conveniently check information and stay up-to-date with seafood news. Odds are, if your seafood is recommended by the SFW and has a blue label from the MSC, then your purchase is an environmentally friendly one. You can visit the SFW website by clicking the picture below. Pay attention to your local seafood news if you live in a coastal community and stay up-to-date with the facts. In the past few months, portions of the Canadian and New England lobster fisheries have been under scrutiny for lack of sustainability, not only for over-fishing lobster, but for their role in whale entanglements and deaths. The SeaFoodWatch program actively recommends consumers seek alternatives to lobster caught in or near the southern portion of New England because of whale entanglement risk. NOAA has also issued an ‘Unusual Mortality Event’ because of the sudden rise in North Atlantic Right Whale deaths from commercial lobster fishing gear in that area. To read more from the NOAA issued warning, click here. Remember that sustainability is a choice, it’s never okay to put our environment at-risk, and we as a global community have the responsibility to treat our environment and its other species with respect. Treating our environment with respect is actually easy, begin by saying something through asking for sustainably fished seafood. Then, empower yourself through resources like the Monterey Bay Aquarium's seafood watch program. Finally, pay attention to your local news sources and other environmental groups. The next time you eat seafood, remember what it takes to bring it to your dinner plate. Recycled Plastic Islands: A New Concept of Urban Spaces?